Badge engineering is something which a country-specific manufacturer manages to pull out effortlessly, with the Perodua Aruz being one perfect example of that. Basically, a Toyota Rush with badges of Toyota swapped out for that of Perodua, the Aruz is Perodua’s flagship vehicle in Malaysia. The Rush, as we all know, is one of the most practical and desirable vehicles in its segment, and the Rush being completely the same vehicle in and out, manages to be the same as well. There are absolutely no changes to the exterior design as well as interior cabin design and features setlist in the Perodua Aruz, when it comes to comparison with Rush. Even the 1.5-litre four-cylinder petrol engine with 4-speed automatic gearbox has been retained in the Perodua Aruz, without any kind of tweaks carried out. This means, here too in the Aruz, the engine produces 105 PS of maximum power output and 135 Nm of peak torque output. Have a question on Aruz? Aruz is available in 5 different colors - Electric Blue, Ivory White Solid, Glittering Silver Metallic, Granite Grey and Amazon Green. With the Aruz entering the Perodua lineup, the long empty SUV space is now filled. It is the same car that Perodua showcased at the 2018 Kuala Lumpur International Motor Show via a peephole. Now, after a few teaser images and a leaked leaflet, Perodua has finally launched the Aruz. This Perodua SUV belongs to the B-segment SUV arena and therefore competes with the likes of Toyota Rush and Honda BR-V. 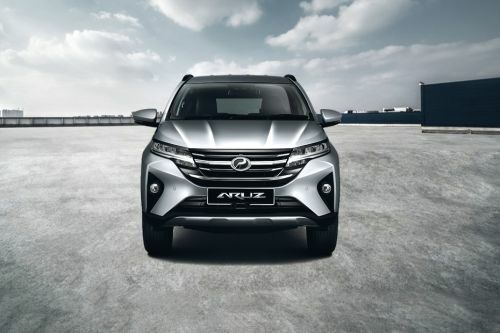 It is to be noted, that the Aruz is no direct rival to the Proton X70, as they belong to different segments altogether. The Perodua Aruz is available in two variants - X and AV. Both the trims powered by a 1.5-litre naturally-aspirated four-cylinder Dual VVT-i engine. The cabin looks plush and is loaded with modern amenities, and all the three-rows provides ample seating space for seven passengers. Proving a safe driving experience, the Aruz is blessed with an array of features. The Aruz can be purchased in five color shades - Amazon Green, Granite Grey, Electric Blue, Glittering Silver, and Ivory White. Price for the base variant starts at RM 72,200. Open the doors of the Aruz, and you’ll be greeted by premium-ness. As every aspect of the cabin from the material used to comfort to features to built quality is done with sheer thoughtfulness. It’s truly commendable, how Perodua has shaped the Aruz. With a capacity of seven individuals, the Aruz offers a spacious and comfortable cabin. Plus, the flexible seating arrangement makes accessing the second and third-row so much simple. Talking of which, the second-row seat comes with recline, slide, and tumble functions. The semi-bucket seats are comfortable and are a treat when going on long journeys. The base trim gets fabric upholstery as a standard option, and leather ones are offered with the range-topping AV trim. Adorned in top-quality finishes, the dashboard looks upmarket. Also, all the equipment are placed ergonomically. As for the driver’s arena, there’s a smart information cluster with MID, and tilt adjust multi-functional steering wheel. While the X trim gets a urethane steering, the one seen on the AV variant is wrapped in leather and even has a Bluetooth call button along with standard audio and telephony ones. The list of Aruz standard features includes - a 7-inch touchscreen head unit, second-row air-con vents, push start/stop button, single-zone manual air-con system with memory function supported by a digital display, USB port on the first and second row, a 12-volt socket on the third row, and integrated toll reader. The top Aruz variant only gets a few extra elements like an Integrated Driving Video Recorder, and SmartLink smartphone screen mirroring via HDMI port. This trim also features a few chrome accents on the door and Piano black coverage on the dash. As mentioned, in its first impression the Perodua Aruz gives the impression of the Rush. The two despite being rivals share a resemblance. On the dimension front too, the two cars display similar measurements, i.e., 4435 mm X 1695 mm X 1705 mm (L X W XH). The wheelbase and even the boot space tallies at 2685 mm and 213-litre, respectively. Whatever may be the case between the two B-segment SUV, the Aruz still has a more Malaysia oriented design theme. At the front, the Aruz showcases a robust site with its multi-slate grille that’s done beautifully in black and silver accents. The LED headlamps not only add to the car's oomph factor but also are high-tech with standard Follow-Me-Home feature. The units on the AV trim are automatic and are accompanied by fog lamps. The side profile displays a simple yet empowering stance, all thanks to the 17-inch alloy wheels, power folding ORVMs, and roof rails (available in AV trim only). The rear is equally stunning with elements like a wrap-around edgy tail lamp, bold and black tailgate trim, number plate with silver garnish, and rear skid plates. The Perodua Aruz is powered by a 1496cc naturally-aspirated 2NR-VE VVT-i four-cylinder petrol engine. This mill churns a maximum power of 105 PS at 6000 rpm along with a peak torque of 136 Nm at 4200 rpm. This engine comes mated to a four-speed automatic unit that sends the generated power to the wheels. Courtesy to displacement, the Aruz is eligible for the petrol subsidy. The company has also claimed fuel efficiency of 15.6 kmpl. Further enhancing its fuel-saving ability is the Eco Idle automatic engine start/stop tech. Safety is one area about which both the driver and the occupants can rest assured. The SUVs standard safety kit includes the following features, which we think is impressive at this price range - 6 airbags, Vehicle Stability Control, ABS with EBD and brake assist, Hill start assist, Hill descent control, seat belt reminder for all seats, emergency stop signal, and ISOFIX. Taking the safety profile one level up is the AV trim that comes equipped with the Advanced Safety Assist (ASA) 2.0, included in it our Pre-collision braking with pedestrian detection, front departure alert, pre-collision warking with pedestrian detection, and pedal misoperation control. Also, the Aruz secured 5-start rating at ASEAN NCAP rating. The Perodua Aruz is the new entry in the B-segment SUV market. With appealing looks, class-leading cabin and safety feature it’s the perfect pick. Also, the affordable price tag only makes it a deal worth grabbing. What are the Safety Features Available in Perodua Aruz?